Talking about women’s bodies in general and sexual health and rights in particular remains taboo in Iran, even though for centuries Iranian feminists have been fighting to break these barriers. 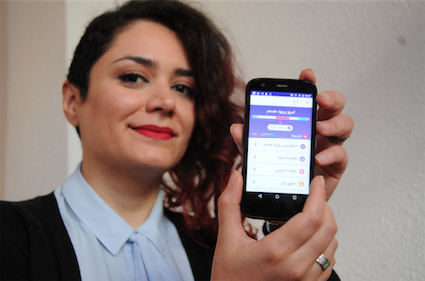 Queer feminist Soudeh Rad entered a competition organised by United for Iran, sparking a collaboration that created Hamdam – an app that has been downloaded over 165,000 times in Iran since it was launched. Leslie de Freitas interviewed United for Iran’s Communications Director, Mahdieh Javid, about how Hamdam came to life, and what else is in the pipeline for IranCubator. Hamdam seems like a great example of what can be achieved when people from a variety of areas join forces. Who are the key players in this case? United for Iran is an independent nonprofit, based in the Bay Area, California. We advance civil liberties in Iran by advocating for human rights, supporting civil society, and engaging citizens through technology. IranCubator is United for Iran’s incubation project, which we created to build social good apps for the people of Iran. Soudeh Rad,a queer feminist activist, submitted the idea for the app, and was the project lead. And ASL19 is the technical development team for the app, an independent technology and research organization that helps Iranians circumvent Internet censorship. Tell us about Hamdam – what it does, and why it’s important and useful to women in Iran. Hamdam is a mobile application that serves as a one-stop-shop for information related to Iranian women’s legal rights and reproductive health. The app enables Iranian women to track their menstrual cycle (based on the Persian Jalali Calendar), sexual health, and learn about different contraceptive methods and STDs. But it does more than that. Hamdam also allows users to navigate Iran’s legal structures with information oriented to increase female users’ access to legal rights in a gender discriminatory legal system. The app provides a database with easy to understand language on marriage laws and how women can tackle issues related to employment, education, divorce, domestic violence and division of assets. Hamdam is designed to empower Iranian women with their sexual health and protect their rights in a challenging society. Thus Hamdam, which in Persian means companion, aims to be Iranian women’s health and rights companion. The app is available on Android devices – the most commonly used smartphone in Iran, comprising 80% of the Iranian smartphone market. Where did the initial spark come from? Talking about women’s bodies in general and sexual health and rights in particular remains taboo in Iran, even though for centuries Iranian feminists have been fighting to break these barriers. As a queer feminist, Soudeh Rad wanted to create an app to empower Iranian women, focusing on sexuality and legal rights. How did you find the tech people you could trust, to collaborate with? We worked with ASL19, an independent technology and research organization that helps Iranians circumvent Internet censorship. They have been a long-time partner of ours, helping us bring to life other technology solutions for Iranians. We needed to come up with a reliable algorithm regarding the period tracker. One of the most important aims of this app is to make sure every user knows their individual cycle. Our female developer and product owner led the researchers and consulted gynecologists in Iran to make sure the algorithm is suitable for individual users. Hamdam is also trans-friendly, and does not assume that all users who menstruate are women. We also wanted Hamdam to serve the largest community possible. Thus, we had to make sure the language is easy to understand and free of prejudice; and that it’s presented in a way that even more conservative users feel comfortable with the app. Consequently, we decided not to use any anatomical pictures. Another challenge was that to shield it from conservatives’ attacks, it had to be introduced without explicitly referencing “feminism,” “women’s rights” or even “sexuality”. Ultimately, we are happy with the result. The feedback we’ve received confirms that with minimal pushback we have been able to attract and serve a large community. How did you address the security issues, to ensure that people who use the app are not endangered? All our apps including Hamdam go through extensive security testing before they are released. In addition, we do not gather any user information, as other period trackers do. Screenshots have also been disabled on the app, so that no one other than the individual user could view their data. What have been the biggest successes of this project – what are you most proud of? What we are most proud of is that we’ve been able to break taboos. Today, Hamdamoffers Iranian women wide access to information they need for living a more equal and healthy life. With over 165,000 downloads, the app has become a health and rights companion for many Iranian women, and we are both grateful and proud of that. What lessons did you learn from the collaborative process that you would like to share with others who might want to do something similar? We are fortunate that from the very beginning we made working with Iranians inside Iran, activists, advocates and philanthropists, the foundation of our work. We knew that to achieve any real change we need to work with the people we are serving, and not just for them. There is no solution that someone from outside can bring to an issue that is born from local conditions, norms and practices. While we have been inspired by the works of other activists in different communities, we have learned the success of our technologies depends on the community’s involvement in the development, dissemination and adoption of the tools. In the last year, in addition to Hamdam, IranCubator apps have helped tens of thousands of women against domestic violence (Toranj), parents who didn’t know how to better protect their children against sexual abuse (Michka), addicts who need an on demand resource and support system (Haami), and those who simply want to share their voice (RadiTo). Our next app, which will come out in the next few weeks, will allow users to document and report cases of human rights violations securely. They can join our email list to better understand the issues we are trying to address and how we go about finding solutions. We are always looking to expand our volunteer network.